The first pub landlord in England to be prosecuted for flouting the smoking ban has been fined £500. Hugh Howitt, known as Hamish, of Park Road, Blackpool, vowed to continue letting smokers light up in his bars - the Happy Scots Bar and Del Boy's. He appeared at Blackpool Magistrates' Court where he admitted allowing people to smoke on 12 separate occasions. Howitt, 55, was given a discharge on seven of the counts and he was fined £100 for each of the other counts. The offences are alleged to have taken place between 1 July and 27 July. Howitt, who has set up a political party named Fight Against Government Suppression (Fags), was also ordered to pay £2,000 costs. He had initially denied the charges, but changed his plea before the start of a scheduled two-day trial. He had faced a maximum penalty of £30,000. 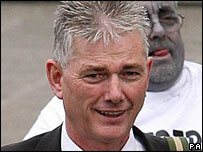 However, District Judge Peter Ward said he did not wish to "make a martyr" of him. Mr Ward said: "That is the law and it has to be complied with. "I suggest your campaign has been silly, pointless and misguided. It has achieved nothing. All it seems to have done is cause a great deal of problems for yourself. "I do not intend to make a martyr of you by imposing swingeing penalties." The landlord was also ordered to meet the costs incurred by Blackpool Council, which brought the prosecution. Outside court Howitt remained defiant and said: "I'm not putting two fingers up at the judiciary. "I'm putting two fingers up at posturing political prats. "I'm going to fight on and fight on. I'm not putting anybody out of my pub until they shut me down." The smoking ban, which was introduced on 1 July, forbids smokers from lighting up in enclosed public places. Bar owners and landlords are obliged to enforce the ban and can face fines of up to £2,500 if they fail to do so. People caught smoking in pubs, cafes or restaurants can also be fined £50 for ignoring the new rules. Blackpool Council, which brought the prosecution, said it had been approaching the enforcement of the ban throughout the resort in a "non-confrontational way". A spokesman said its officers had verbally informed Mr Howitt he faced prosecution before the summonses was issued. Councillor Ian Fowler, Cabinet Member for Business Services, said: "I am delighted that this situation has been resolved and Mr Howitt has finally pleaded guilty. "Blackpool Council has a duty to enforce the smokefree legislation. We are not seeking to be heavy handed but to emphasise that we expect the resort to be welcoming and law abiding. "This is part of the council's commitment to continue to clean up the town," he added.